Throughout 2018, Rare and IFOAM Organics have held two-week training workshops to share the methods of community innovators identified in a contest they co-hosted last year, Solution Search: Farming for Biodiversity. Last year’s contest set out to spotlight local organizations with success advancing the adoption of sustainable agriculture in their communities. Through Rare-led training workshops, called Campaigning for Conservation (C4C), the innovators are now bringing their insights to more local people in their native countries. Each workshop is a hands-on training session that demonstrates novel methods for sustainable agriculture, creates a setting for dialogue about the challenges for sustainable farming, and walks workshop participants through the use of social marketing to inspire change. The methods they share, combined with Rare’s expertise in behavior change principles and social marketing practices, as well as IFOAM Organics’ experience promoting sustainable agriculture, are equipping field-based conservationists and local farmers with the tools to catalyze community change. In March, Rare and IFOAM Organics held the first of their Farming for Biodiversity workshops on sustainable agriculture in Chiapas, Mexico and Kitale, Western Kenya. While Chiapas and Kitale are half a world apart, opportunity for change in both is ripe: local people are looking to move their communities to alter the very fabric of their farming landscape — starting with seeds and soil. In Mexico, the leaders of Desarrollo Alternativo e Investigación A.C., a Solution Search: Farming for Biodiversity top 10 finalist, shared insights from their work in crop diversification and soil management. Their native Chiapas State is one of the most important agrobiodiversity spots in the world. Several decades of local governments and companies “gifting” conventional seeds and agrochemical packages to smallholder farmers dramatically reduced plant diversity in Chiapas, which has affected the health of people and ecosystems alike, as well as the livelihoods of smallholder farmers. Desarrollo Alternativo e Investigación A.C.’s seed exchange helped boost maize yields. 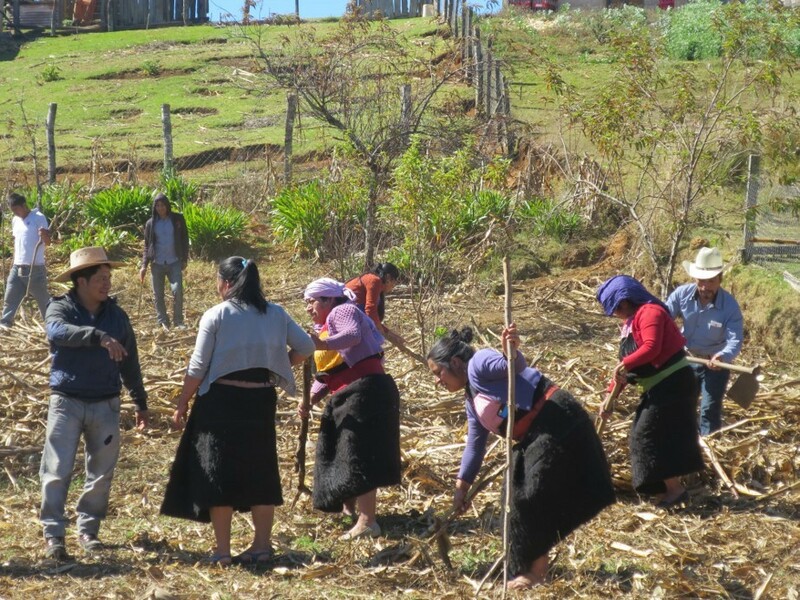 To help boost biodiversity, Desarrollo Alternativo e Investigación A.C. launched a participatory seed dissemination project. 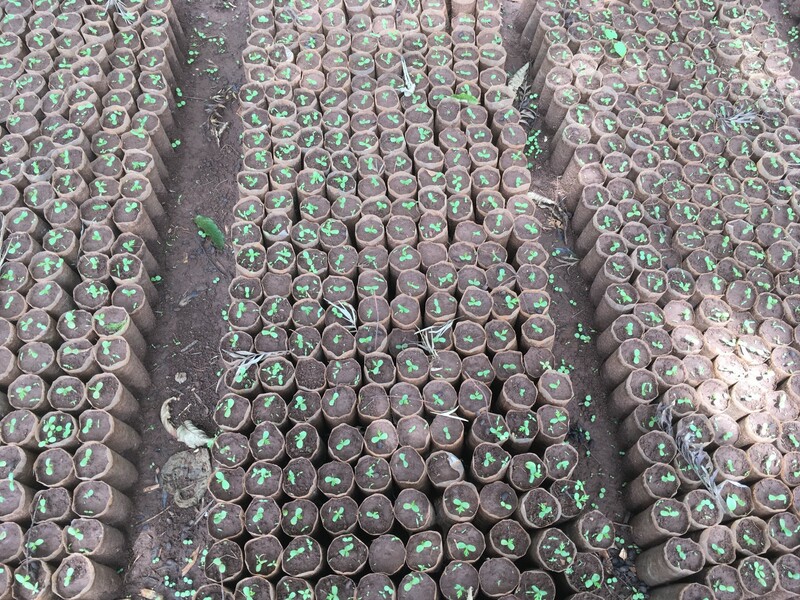 Along with planting more diverse crops, farmers were taught new soil management techniques. 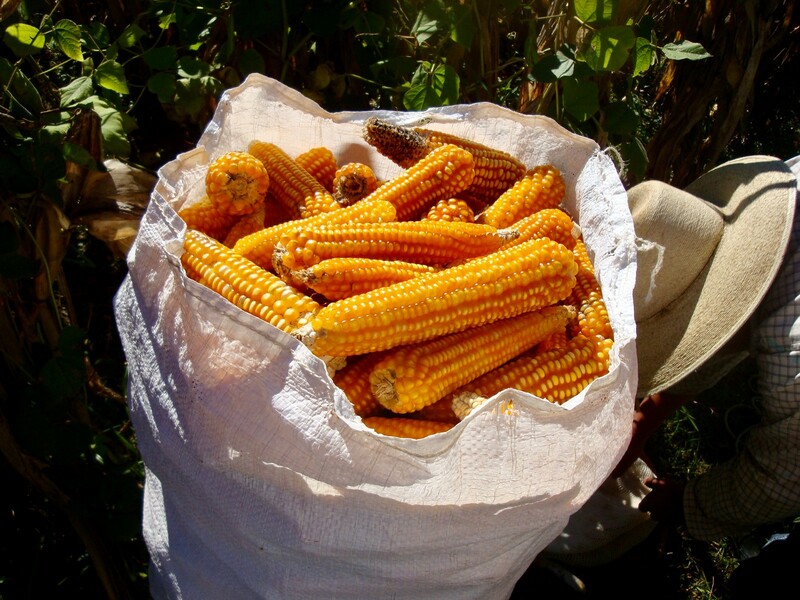 The project increased local maize and bean yields and boosted family income for 1,500 families in Chiapas. This work earned them Solution Search’s “Food Security & Nutrition Impact” award. With more than 45 members of the local farming community in their native Chiapas attending the workshop, its lessons and activities took place amid visits to working farms, allowing local producers to discuss the current context — how farmers operate today. On the first day of the training, for instance, farmers Anastacia Hernández Patishtan and Carmela Hernández Ruíz took the workshop group to their farms and showed them the ecological practices and seed varieties they use. C4C workshop participants compose a song as part of their social marketing efforts. As the workshop proceeded, Dulce Espelosin of Rare detailed ways to accelerate the adoption of sustainable agriculture. Espelosin laid out theories of behavior change as applied to environmental sustainability, describing how conservationists can tap into behavioral science insights on individual and group behavior to achieve their goals. She also described the social marketing techniques that can be used to catalyze behavior change. During the training, workshop participants split up into groups to practice several of Rare’s signature social marketing techniques: scripting public talks with spiritual leaders, planning out puppet shows and designing costumes for them, designing posters, painting murals, working with musicians to create songs for local radio, and more. 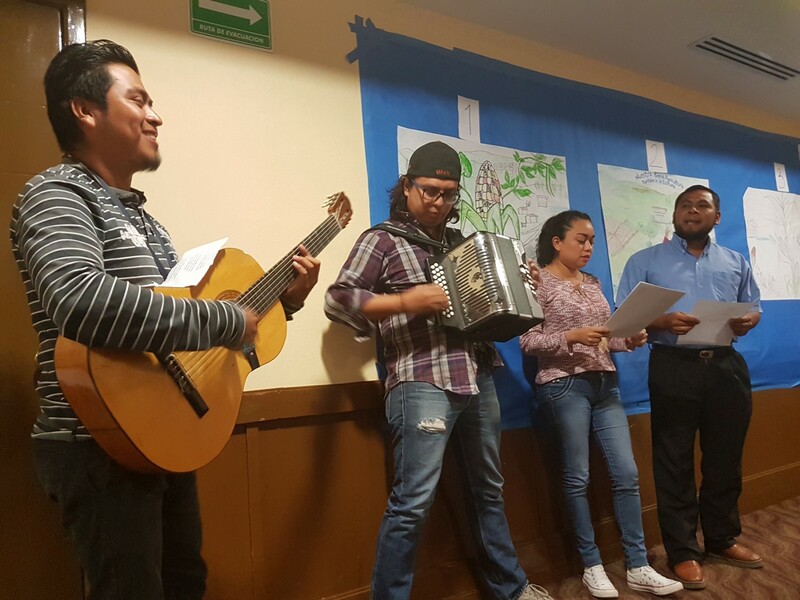 Participants looked at how they could adapt their use of these techniques to their goals in Chiapas, namely promoting practices that improve land conditions. Doing so can reduce production costs, boost food diversity, and allow for seed conservation. In Kitale, Western Kenya, the C4C workshop took place at the office of Manor House Agriculture (MHAC), the second Farming for Biodiversity practitioner selected to host the training alongside Rare and IFOAM Organics. Manor House was also selected as a Farming for Biodiversity top 10 finalist for its solution to promote climate-smart farming. Manor House grows food using biointensive agriculture — a climate-smart farming technique. More than 70 percent of farmers in Kenya are small-scale farmers that practice conventional farming and use fertilizers, which produce greenhouse gases and degrade soil. As a result, maize and bean yields decline, threatening food security in a region already grappling with poverty and unemployment. Furthermore, recent droughts have forced farmers to cultivate riparian land for food, resulting in silting and polluted rivers. Biointensive agriculture, as practiced by Manor House, produces two to four times more food, improves nutrition, promotes biodiversity and limits greenhouse gas emissions. MHAC’s leadership shared the organization’s journey advancing biointensive agriculture , an alternative farming strategy that makes use of methods like composting, deep soil preparation, companion planting and non-chemical pest control. Biointensive agriculture can produce two to four times more food, improve nutrition, promote biodiversity, and limit greenhouse gas emissions. As in Mexico, participants directly engaged with MHAC on its work and local adoption of its methods, and received immersive instruction on the theory and practice behind behavior change, social marketing, and promoting community adoption of sustainable agriculture. Participants were also able to look more closely at the history, principles and practice of organic agriculture in Kenya, with help from IFOAM Organics. Konrad Hauptfleisch, Academy Manager at IFOAM Organics, took the workshop group through five local farms, each showcasing different farming operations, from a large-scale conventional dairy operation to a smaller enterprise run using conservation zones. 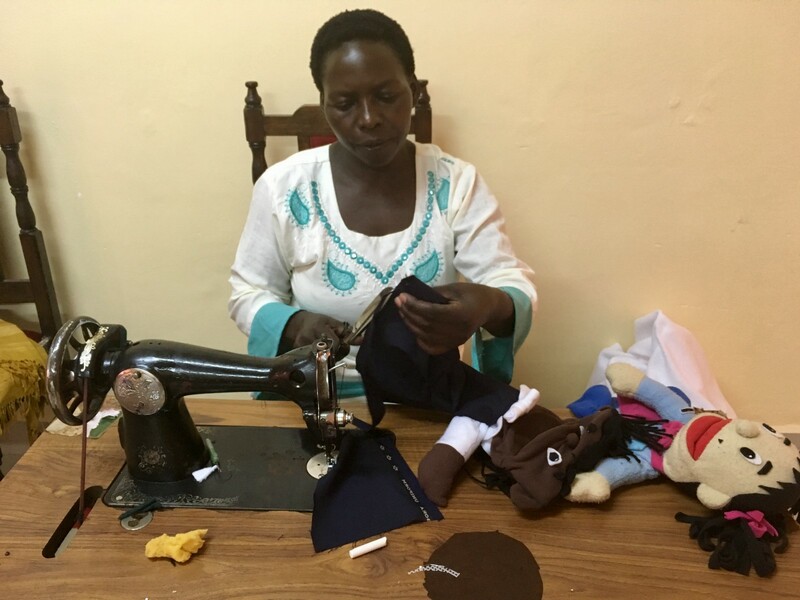 Kitale C4C workshop participants incorporated puppets into their campaign. Puppet shows are a social marketing tactic used to engage all members of the community—especially children. To take stock of the training’s impact on participants, Rare surveyed those who took part in both Mexico and Kenya. 100 percent of participants from the workshops said they would recommend the training to others, while 96 percent plan to apply for campaign grants that Rare and IFOAM Organics are offering to help them scale their ideas. Looking forward, the ultimate goal is scale — allowing the brightest ideas in sustainable agriculture to spread far beyond the borders of a single, small farming community. This series of Campaigning for Conservation workshops is part of a larger project funded by the International Climate Initiative (IKI), a German initiative supported by The Federal Ministry for the Environment, Nature Conservation and Nuclear Safety (BMU) on the basis of a decision adopted by the German Bundestag. To learn more about this part of Rare’s work, please contact Kate Mannle for Campaigning for Conservation (kmannle@rare.org) and Ann-Kathrin Neureuther for Farming for Biodiversity (akneureuther@rare.org). This story is also posted on Rare’s stories page. Inspiring change so people and nature thrive. Learn more at Rare.org.